While I like to assume that my husband married me for my irresistible charm, girlish good looks, and sparkling personality, I know better: he married me for the easy baked beans. Broadly speaking, he actually married me for Kansas City barbecue, of which baked beans are a critical component. I’m not sure which it was that finally lead him to say, “I do”—a lifetime of putting up with my antics enjoying my company or the KC pulled pork, but ever since we stopped for lunch at this legendary establishment, he’s been very very enthusiastic about being a part of a Kansas family. Whenever we head back to my hometown, at least two barbecue runs are a mandatory part of our travel agenda. In between trips to Kansas, we’ve tried to alleviate our ‘cue cravings at two local barbecue joints here in Milwaukee. Neither came close to what we can find in KC, so I’ve come up with a few imitator recipes of my own, my favorite of which thus far is today’s healthy, easy “baked” beans. 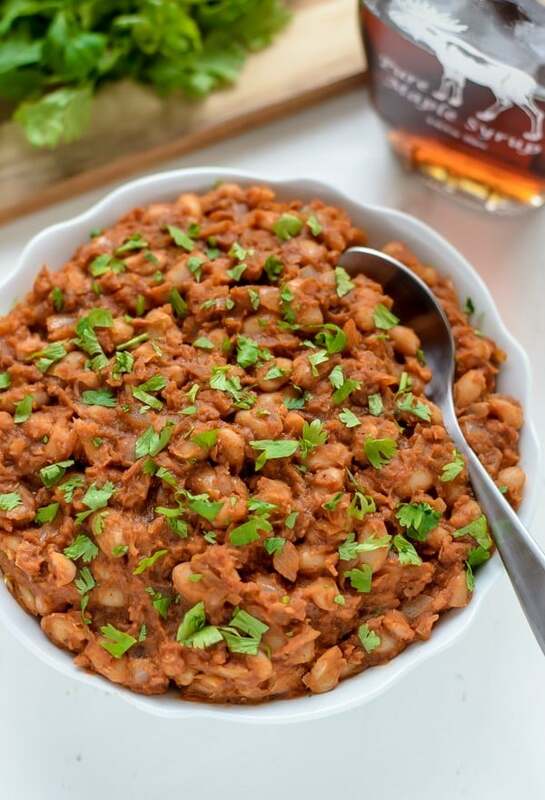 Although I might lack the proper equipment, meat supply, and beard to be a serious barbecue contender, these barbecue beans still scratch our barbecue itch, and they are a sure hit at summer potlucks too. Unlike most traditional baked bean recipes, which can take hours to prepare and are on the heavy side, these easy baked beans are ready in 30 minutes, don’t require you to turn on the oven, and are much, much healthier for you too! To create a baked bean recipe that was reasonably healthy, took only minutes instead of hours, and didn’t involve heating up my kitchen, I knew I’d need an outstanding barbecue sauce and ketchup to build their flavor. Unfortunately, most brands of both contain conspicuous levels of high fructose corn syrup, and when combined with the gobs of brown sugar present in most of the “quick and easy” baked bean recipes I found, I felt like I was making a dessert, not a respectable side dish. Thus, I nearly did a happy cartwheel when the folks at Tessemae’s reached out to me to try their line of all-natural condiments. Back to the beans. In addition to our stellar, better sauces, the secret to building big barbecue bean flavor without the extra heft is spice. I flavored these babies with smoked paprika, a little dry mustard, and cumin. Instead of brown sugar, I swapped pure maple syrup, which adds natural sweetness and a bit of extra smokiness too. Making these easy baked beans is as simple as sautéing onions, stirring everything together, then letting it simmer on the stove. In 20 minutes, the ingredients transform from barbeque Jacuzzi into a sweet, smoky, savory pot of healthy barbecue bean satisfaction that’s ready for a summer party. While I won’t be smoking a rack of ribs in our backyard anytime soon (unless you have a smoker and a burly man to operate it that you’d like to send over? ), I’ll happily supply the sides for any summer gathering, starting with the barbecue baked beans. Discount time! I’m excited to be partnering with Tessemae’s to offer 10% off your total purchase at Tessemaes.com. Enter the code ErinTesseFamilyDiscount at check out and enjoy the upgrade to your refrigerator. In addition to Tessemae’s condiments, I also highly recommend their dressings (especially the Green Goddess). As an FYI, because many of the dressings and marinades are olive oil based, the olive oil will solidify when the dressings are chilled in the fridge. This is a good thing—it means the dressings are made of real ingredients. To use the dressings once they are solidified, simply let their dressing warm to room temperature or run it under warm tap water for about 30 seconds. Enjoy! A recipe for easy baked beans that uses natural ingredients like maple syrup and is ready in 30 minutes. A healthy baked bean recipe with big time flavor! Rinse and drain beans. Set aside. In a small bowl, whisk together the barbecue sauce, ketchup, maple syrup, tomato paste, Worcestershire, paprika, mustard, cumin, salt, and pepper. Set aside. Heat the olive oil in a small saucepan over medium high. Once the oil is hot, add the onion and sauté until fragrant and soft, about 2 minutes. Add the barbecue sauce mixture and bring to a boil. Add the drained beans, reduce heat to low and simmer for 20 minutes, stirring occasionally. Serve warm. I am sharing this post in partnership with Tessemae’s. As always, all opinions are my own, and thank you for supporting the brands and companies who make it possible for me to continue sharing quality content with you! Yes, let’s talk about Oklahoma Joe’s (well, now it’s called Kansas City Joe’s)! It’s the BEST. I’m Texan, and even I will admit it’s the best barbecue I’ve ever had! I’m loving these condiments sweetened with dates! I just bought date syrup to sweeten my tea and oatmeal, and I love it! I haven’t had baked beans yet this year. That definitely needs to change. Now I’m craving…. Oklahoma Joe’s…………..SWOOON!. Life would not be the same without them! Now, pass me some beans! I’ve always wanted to make “homemade” baked beans – and now I can! I have fond memories of my father attempting to make baked beans from scratch. He dug a small pit in our backyard, added hot coals, and a pot filled with water and uncooked white beans, covered it and waited… They actually cooked and had a smokey flavor, but since Dad wouldn’t let us eat anything with artificial flavors or colors, ketchup was not used to “doctor” them up. So we ate some very strange, white baked beans and wondered why he had gone to all the trouble! Wish he’d had your recipe! Thanks, Erin, can’t wait to make these! It’s SO shocking how much sugar is in the most random and unexpected things! Absolutely love that this brand is sweetened with dates….I need to get my hands on some! And these beans! Get in my belly! These baked beans sound fantastic! Can’t wait to try them at our next bbq! Ahhhh I don’t know what we’d do if we didn’t have Kansas City Barbecue at our fingertips…Baked beans are by far my favorite side (except for cheesy corn bake at Jack Stack) when it comes to barbecue, but I never ever make them at home. What’s wrong with me?? Need to try these!! I havent made baked beans for ever. They sound super delicious. Although, I gotta admit, I find it strange you guys eat them at picnics and at times outside breakfast, and even that you classify them as summer food. Crazy that! That BBQ sauce sounds awesome! I’ve been loving TJ’s Sriracha BBQ sauce but it’s made with refined sugar which I usually try to avoid so I love the idea of one that’s naturally sweetened with dates. And yes to all of the easy baked beans. They’re a classic summertime favorite! It’s crazy how much sugar pops up in BBQ foods, store-bought or homemade! 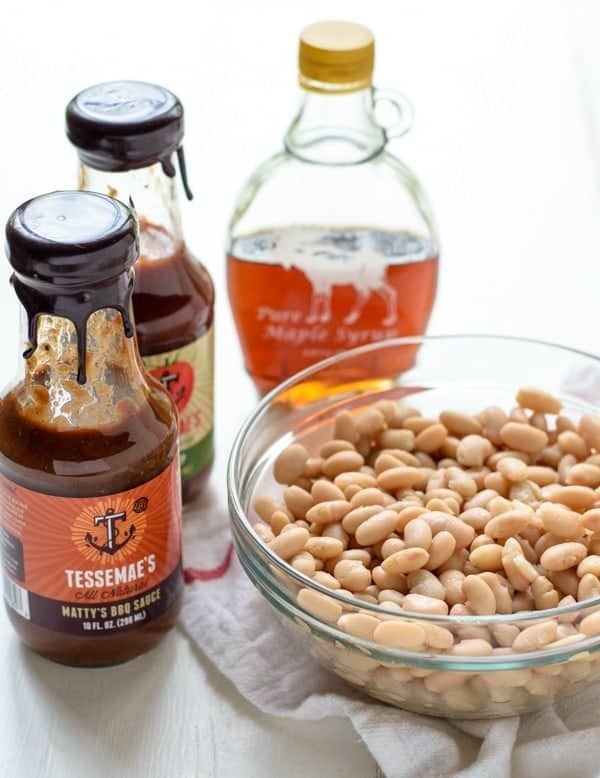 That Tessmae’s sauce sounds soo delicious! Can’t wait to make a batch of baked beans at home now! Tessamae’s ANYthing is SO good! Have you had their honey mustard?! These beans look perfect for a BBQ! I love baked beans!! I’ve never made my own before – these look delicious!!! This looks like the perfect summer side dish! Love the sound of the BBQ sauce! Erin: Have you tried Pat’s Rib Place in Waukesha? Not yet! I hadn’t even heard of it. Thanks so much for the tip Barb! Can’t wait to check it out. Love all the flavours in these baked beans. I love baked beans so much, but still haven’t got round to making them myself, I really need to make these! I loooove beans in all shapes and forms, and baked beans is actually one of my all time favourite thing to eat! Definitely don’t blame your husband for marrying you for this recipe, I would too haha! Thanks so much Teffy! If you try it, I hope you love it. Does the picture include cilantro on top? Just a handful for presentation? Hi Judy! Just for presentation, though it’s nice to add a bit of freshness if you like. Green onions are another lovely option. I am on a low sodium diet and am always looking for healthy options. Not only are these beans full of flavor, even with low sodium ingredients, but they are so fast and easy! That doesn’t happen often when making low sodium foods. This recipe is a keeper for me! Donna, I’m so glad to hear the recipe is a winner for you! Thanks so much for taking the time to leave this awesome feedback!